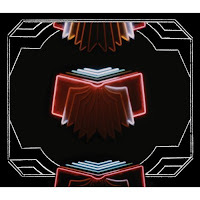 I can’t stop listening to Intervention from Arcade Fire’s new album Neon Bible. The church organ intro, the steady build, the unexpected chord changes near the end – it’s just great. I’ve been a little slow jumping on the Arcade Fire bandwagon. In the past week, I’ve read numerous articles about them, including a big feature in last weekend’s New York Times Review. I downloaded their performance from SNL a couple of weeks ago and was really impressed – what other group these days is using a hurdy-gurdy, glockenspiel, and french horn? I’ve gone back to give Funeral a second chance and it’s definitely growing on me. ChorusWho’s gonna throw the very first stone? Oh! Who’s gonna reset the bone? Those are all references from the Bible. I heard that was a pretty good book. What’s the author’s name again? I like it. It’s okay as Bibles go, but The Author hasn’t published anything in nearly 2000 years. He must have got tenure.